The advent in the fall of 1845 by John C. Fremont with his exploring pack party crossing the Great Salt Lake Desert, began a chain of events that led to the opening of the Hastings Cutoff and of emigrants traversing the desolate Great Salt Lake Desert. These emigrants were looking for a shorter way to California which almost led to their demise when crossing the Great Salt Lake Desert due to the long distances without water and lack of feed for their stock. The cutoff left the California Trail at Fort Bridger in Wyoming, passed through the Wasatch Mountains, across the great Salt Lake Desert, looped around the Ruby Mountains, and rejoined the California Trail about seven miles west of modern Elko, Nevada. Clyman/Hastings party crossed the Salt Lake Valley, continued on up over Big Mountain, down to the Weber River, up Echo Canyon where they separated with Clyman going NE and Hastings proceeding on to Fort Bridger. Hastings then followed the Oregon Trail east until he met the emigrants on the road. He convinced several emigrant parties to take this new route extolling its merits and that it would be shorter [it was actually longer] than the road to Fort Hall and to California. The Bryant / Russell pack party was the first emigrants in 1846 to take this new route followed by the wagon companies of Harlan/Young, Hoppe/Lienhard, and the last company of the year, the Donner /Reed party. Much has been written about the cause of the Donner Party's calamity; about the time spent building a road over the Wasatch Mountains; about the time spent looking for the stray oxen while at Donner Spring; about the quarreling between different factions of the company and how they arrived too late to cross the Sierras because of the early snows. But little if anything has been said about Hudspeth and his honest intentions and who unwittingly caused the delay and in the end the disaster. "... It may be assumed that Hudspeth met these wagons at the mouth of Echo on the evening of July 26 or the morning of July 27. This chronology is significant for two reasons: (1) It had taken the wagons only seven days to cut their way through the upland country from Fort Bridger to the mouth of Echo; consequently they had relatively little trouble on the first section of the new route. (2) Heinrich Lienhard's journal shows that Hastings spent the night of July 27 with a rear company at Bear River; consequently he was almost 40 miles away when Hudspeth met the immigrants who were breaking trail, and could have had no part in their decision to descend the Weber through its canyons. It is evident from Lienhard's further entry of August 3 that Hastings at no time had contemplated taking the wagons down the Weber, that his intention had been that all should take the route across the mountains he himself had followed in coming east." 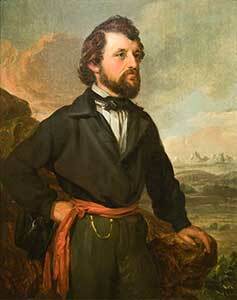 Heinrich Lienhard wrote in he diary while in Morgan Valley on Aug. 3rd, 1846: ". . . we encountered Captain Hastings, who had returned to meet us . By his advice we halted here. He was of the opinion that we, like all the companies who had gone in advance of us, were taking the wrong road. 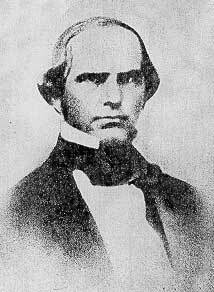 He had advised the first companies that on arriving at the Weber River [Henefer} they should turn to the left which would bring them by a shorter route to the Salt Lake; this advice they had not followed, [because of Hudspeth] but trusting to their luck had taken the road down the river." Hudspeth, having been with Clyman & Hastings when they came over Big Mountain two months earlier and after exploring Weber Canyon, was convinced that the Weber River was a better way. He then persuaded the Harlan Young company that a water level route could be made down through Weber Canyon even though he was not present to see the difficulties encountered by the wagons and animals later along this route. His decision to go down the canyon eventually caused a major delay for the last company, the Donner/Reed party. They were caught in an early snow storms by October 28, 1846. Some were later rescued and nearly half of the party perished from starvation mainly because of the loss of time particularly the 12 precious days building a road over the Wasatch Mountains all because of Hudspeth's TRAGIC DECISION.